Heat oven to 425°F. Spray baking sheet with cooking spray. Unroll dough on baking sheet; starting at centre, press out dough into 14x12-inch rectangle. Brush dough with olive oil; bake 7 minutes. Spread pizza sauce evenly over crust; top with mozzarella cheese and parsley. 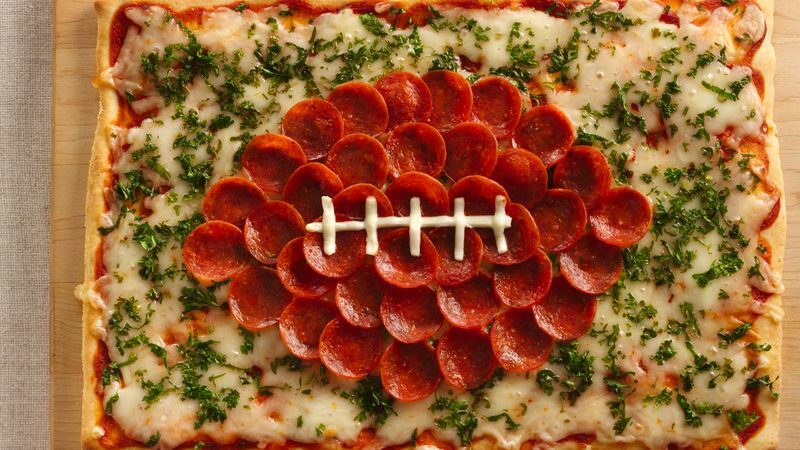 Arrange pepperoni in football shape on centre of pizza. Cut string cheese lengthwise into 4 strips (save 2 for another use). To make football laces, place 1 strip horizontally on centre of football. Cut remaining strip into 5 pieces; arrange vertically on top of horizontal strip. Bake 10 to 13 minutes longer or until crust is deep golden brown and cheese is melted and bubbly. To serve, cut into 4 rows by 4 rows, making 16 pieces.